The legendary sacred cactus of South America was known by many names to the native peoples of the coast and sierra of Ecuador, Peru and Bolivia – wachuma, huachuma, achuma, chuma, cardo, cuchuma, huando, gigantón, hermoso and aguacolla. Today it is best known in Peru by it’s post-colonial name San Pedro, a reference to the Christian saint who holds the keys to the Gates of Heaven. San Pedro or wachuma is a teacher plant and, like Ayahuasca is a part of ancestral medicine plant family. Being of Andean origin, San Pedro has been used for thousands of years in Andean spiritual traditions through by South America’s mountain region priests and medicine men as a part of their spiritual practice. The experience with San Pedro carries a quality of smooth reconnection with one’s body and mind, it feels like getting rid of a veil and reconnecting with our original state of consciousness. Rather than being carried away into psychedelic realms, its very common to have a sense of returning to primordial state, where everything is included and seen for what it is. The experience with San Pedro unfolds in a full presence with all senses, processes in nature, passing of time. Through being present in oneself and seeing the human condition, a person is able to know directly his place in this reality, including it as a part of a much larger journey, that surpasses space and time. The teachings of San Pedro as master medicine are said to be like the energy of sun, gentle and, at the same time firm and uncompromising, representing the masculine aspect of a master plant. The Huachuma (San Pedro) cactus (Trichocereus pachanoi, T. peruvianus and other species) represents perhaps longest-used of the sacred holistic healing plants of South America. The ceremonial use of Huachuma (San Pedro) for healing, magical and divining purposes has been a continuous tradition in Peru for well over 3,000 years and continues today, largely in syncretic post-colonial “San Pedro” mesa modalities. The oldest archaeological evidence, the classic Chavín stone carving of the huachumero shaman in the Old Temple of Universal Consciousness at Chavín de Huantar in northern Perú, goes back to 1500 b.c. if not older. Old Chavín textiles depict the cactus with jaguar and hummingbird figures. Peruvian ceramics made between 1000 and 700 B.C. show the plant in association with the deer. Moche ceramics several hundred years later depict the cactus with the jaguar and stylized spirals depicting ‘remolinos’, the visionary cosmic whirlwind or whirlpool revealed by the sacred plant. Trichocereus pachanoi and T. peruvianus are tall columnar cacti sometimes reaching over 8 meters in height. Over thirty species are described although the taxonomy is confusing and there is disagreement concerning the identity of somel species. The species most commonly associated with medicinal use are Trichocereus pachanoi, T.peruvianus which are native to Perú, and T.bridgesii which is native to Bolivia. 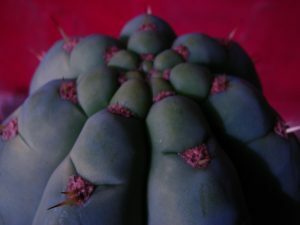 Principal active biochemicals: the phenelthylamine alkaloid mescaline is present, primarily concentrated in the green outer skin of the cactus. tyramine, hordenine, 3-methoxytyramine, anhalaninine, anhalonidine, 3,4-dimethoxyphenethylamine, 3,4-dimethoxy-4-hydroxy-B-phenethylamine, and ,5-dimethoxy-4-hydroxy-B-phenethylamine. Some of these are known sympathomimetics. Others have no apparent effects when ingested by themselves. The combination with the mescaline and other active compounds has a synergistic relationship which greatly influences the qualitative aspects of the experience. It is also possible that some compounds in the plant may act as a mild MAO inhibitor thus rendering a person vulnerable to some of the aforementioned amines which would ordinarily be metabolized before they could take effect. At least one of these alkaloids is an effective antibiotic and others may possess medicinal and/or psychoactive properties. The Huachuma experience is certainly greater than the sum of it’s parts, and it is gross misunderstanding to simply charactize it as a “mescaline” experience. The plant has a powerful and benevolent spirit and is MUCH more. 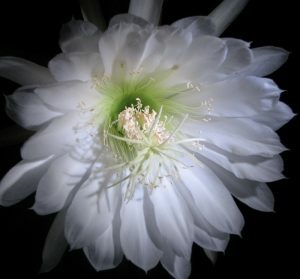 The goal of the maestro curandero is to make his patient “bloom” during the ceremony, to make his subconscious “open like a flower,” even like the night-blooming Huachuma itself. The traditional entheogenic status of the cactus in Peru remains strong today, centered in the legendary town of Huancabamba, in the northern Andes, at the threshhold of the sacred lagoons of Las Huaringas. Hundreds of Peruvian pilgims and a few foreign esoteric tourists make the pilgrimage to Huancabamba and the sacred lagoons of Las Huaringas every year to bathe in the magical waters of the sacred lagoons and achieve their “florescimiento” or “blooming”, to change their luck, find love, or seek healing. Not only is San Pedro still used in shamanic trances and healing sessions throughout the northern coast and Andes but it is also used increasingly to combat contemporary problems such as alcoholism and other addictions. 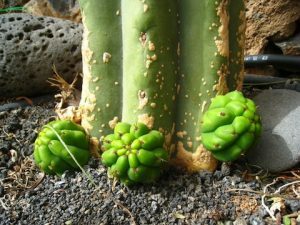 Like the peyote cactus used widely in some parts of Mexico and North America, mainly by native people, huachuma is also a holistic medicine which can cure alcoholism and other addictive or behavioral problems. This parallel is noteworthy because since both cacti contain mescaline which is known to be a highy revelatory and transformative agent of higher consciousness. Both are good medicine indeed, and are here for everyone who needs them and is called to them. As long as there is no struggle, imposition and preference, every moment is simple, undistorted perception – a Direct Experience of what is.